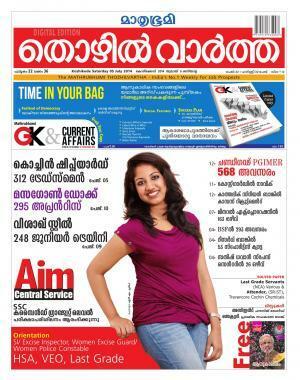 Mathrubumi Thozhilvartha, one of the top employment weekly in Kerala has published its 5th July 2014 issue. As like its previous issues, key importance is given to the Kerala PSC notifications and solved paper. The major highlight of the current issue is the latest PSC notifications. The rank list of Assistant Housing Board, Secretary-Co-operative Bank has also been published. With August 2014 being much important to PSC aspirants, orientation is given on the upcoming exams like Sub Inspector of Police, Excise Inspector and Women Excise Guard/Women Police Constable. Through the exam point of view, HSA, Village Extension Officer (VEO) and Last Grade are given much considerable preference. The solved paper of the recent Last Grade Servants, Attender exam would help those candidates who are preparing for the forthcoming exam. While going through the pages, 312 vacancies in Cochin Shipyard, 295 Apprentices in Masagon Dock, 248 Junior Trainee in Vishak Steel, 568 vacancies in Chandigargh PGIMER, Navik in Coast Guard, Catholic Syrian Bank Recruitment, 163 opening in Meneral Exploration, 293 vacancies in BSF, 53 Sports Quota vacancies in Reserve Bank, 26 vacancies in Satheesh Dhavan Space Centre are also mentioned in the current issue. The SSC combined graduate level exam coaching is another major feature of this issue. The rank list of Assistant Housing Board and Secretary-Co-operative Bank give an opportunity for those who got into the list to make a self preparation for the job. A free booklet with latest general knowledge would be helpful to update the new events which happened in the near past. As the Sub Inspector of Police, Excise Inspector and Women Excise Guard/Women Police Constable fall in August 2014 and first phase of Last Grade Servant exam begins in September 2014, 'Thozhilvartha' would be bringing more crash coaching for the PSC aspirants who are preparing to clinch their dream job. More solved question papers and coaching for upcoming PSC exam can be expected in the next issues. Job seekers in Kerala can best use 'Thozhilvartha' to check for rising opportunities and also could apply for their preferred posts. Having a circulation of more than 1 lakh copies, 'Thozhilveedhi' is the most demanded employment newspaper among the reading community. It has already become a medium for training many youngsters to live their dreams. Known as an effective platform for job vacancies and career training, this newspaper has motivated million to thrive and achieve success in life. So can you leave the current issue of this ostentatious employment newspaper? Grab 5th July 2014 issue of 'Thozhilveedhi' from your nearest book vendor and be the real winner. Mathrubumi Thozhilvartha 12th July 2014 issue is now in stands. To read the latest issue of Mathrubumi Thozhilvartha dated 12 July 2014 (published on 7 July), buy a copy from your local book vendor. Thozhilvartha published by Mathrubumi is one of the leading employment weekly featuring updated news on rising opportunities in public and private sectors.